Trivia Playing Cards for years 1943-1980. 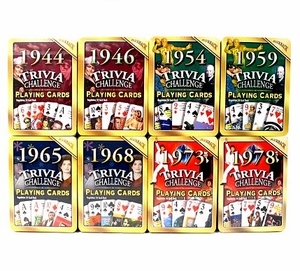 For a fun birthday gift to send to your clients on their birthday, consider sending a deck of trivia playing cards. Each deck has trivia questions for that particular year with also the functionality of being regular playing cards. You will see one trivia question per card, with the answers available. Available for years 1943-1980. Contact Us for a quote about volume discounts.